Yes, if you select the "keyed alike" button when ordering the Global Link RV Entry Door Locking Latch Kit # 295-000019, # 295-000004, and # 295-000078 they all will come keyed alike. You sure can order the Global Link RV Entry Door Locking Latch Kit # 295-000019, # 295-000021, or # 295-000002 with a keyed alike option. On the product page you will find a box with a drop-down feature and you can choose Keyed Alike or Keyed Unique, Then adjust the quantity you want and add to cart. We carry a few different types of Locking Cam with Keys that could work for your application. The Cam Lock Cylinder with Key, # 295-000003, can replace 7/8 of an inch long cam. The attached link will display all the locking style cams and the corresponding lengths of these cams. Since you are looking for a thumb latch that includes the offset cam you'd want the part # CAM44323 instead as that is included. This is designed to fit a 5/8 inch hole. Global Link makes several different key numbers like the part # 295-000079 which is key number 391, and part # 295-000060 which is key number 334 etc. These are generic keys that all open locks universally. Are you looking for a specific key number? You will want the Replacement Key for Global Link RV Locks - 301 - Qty 1 # 295-000008. This will work on RV entry doors, baggage doors or vice locks that have the number 301 stamped on the key. Can RV Entry Door Locking Latch and Cam Lock Cylinders Be Keyed Alike? Yes. 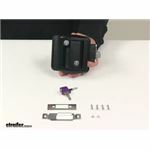 The Global Link RV Entry Door Locking Latch Kit with Keyed Alike Option - Black # 295-000019 and the Replacement Cam Lock Cylinder for RVs - Keyed Alike Option # 295-000003 will all come keyed the same when you select keyed alike from both products within the same order. We have exactly what you are looking for! If you are just wanting to replace the lock cylinders you can use part # 295-000003, but if you are wanting to replace the latches themselves then you will want to use part # 295-000078 instead. Both come with a keyed alike option that you can choose in the drop down menu on the product page. Then all you have to do is enter the quantity you want and add it to your cart. Yes, if you select keyed alike on the drop down menu for the Replacement Cam Lock Cylinder # 295-000005 when you also order the # 295-000015 it'll come keyed alike. We have exactly what you are needing. 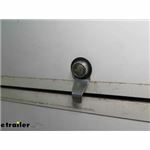 For a replacement key that will fit your existing 345 Global Link RV Lock, you will use the Replacement Key # 295-000071. This key will work perfectly with your lock. This will include 1 key, so I recommend ordering a couple so you can have some spares on hand. The Global Link RV Entry Door Locking Latch Kit with Keyed Alike Option - Black # 295-000019 can be installed on your cargo trailer door if you desire. It fits doors that are 1-1/4 to 1-1/2 inches thick. It will allow you to still use the cam-door style lock like # 305736 as long as the RV door handle is under the bar so it doesn't interfere with the bar system. We don't have the ability to order the lock cylinders by key number. 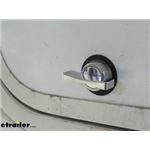 I recommend getting the Global Link RV Entry Door Locking Latch Kit with Keyed Alike Option - Black # 295-000019, White # 295-000021, or polished chrome # 295-000002 to give you a replacement latch. These replacements can be keyed unique or keyed alike, but we can't specify to ensure they are keyed to the G311 key. Yes, we sure do! For a stainless steel 1-3/8 inch long thumb turn cam latch cylinder use # 295-000013. Sounds like you are looking for the Replacement Thumb Turn Cam Latch Cylinder # 295-000011 for the twist lock style and the part # 295-000003 for the lock cylinders. These match your descriptions and dimensions. We do not have a list of specific parts for trailers, so the Replacement Key for Global Link RV Locks # 295-000149 would only work on your 2018 Forest River Cherokee if its entry door was a Global Link door that had a key number of 360 on it. The Global Link RV Baggage Door Slam Latch with Keyed Alike Option # 295-000015 will work with # 295-000016 for 1-1/4 inch thick or thicker doors or # 295-000017 for thinner than 1-1/4 inch thick doors. You will also need the Global Link Replacement Strike Plate for RV Entry Doors - Steel # 295-000022 since you are switching styles. What you'll want to do is get the dimension of the lock cores that you have now which means the length of the threaded section and we'll be able to pick you out the correct replacements that you can order keyed alike. We have kits like the part # 295-000003 which measures 7/8 inch and is pretty standard but we have other lengths like 1-3/8 inch part # 295-000005 or 1-1/8 inch part # 295-000004.